Conditions are simply perfect for cross country, snowshoeing or whatever you choose at Great Glen! With winter in full swing now, New Hampshire Grand, the official visitor information source for the Great North Woods and the Northern White Mountains, is highlighting winter fun, including the Snodeo, the Great North Woods Vintage Series, Ski and Shoe to the Clouds, Bretton Woods Nordic Marathon and the Great North Woods Sled Dog Challenge. Along with these events and more, the Grand North features plenty of opportunities to get outside—and inside—this winter. Riding snowmobiles manufactured prior to 1973, racers will hit the throttle for 10 laps during The Great North Woods Vintage Series race in Errol on February 21. Now in its 8th season, the four-race series, which culminates in Pittsburg on March 14, gives snowmobile racers the opportunity to tune up their old sleds and take a step back in time. The roar of the engines and the speed of the racers is sure to bring excitement to all ages. For plenty of fun and excitement, check out the 23rd annual SnoDeo, one of the premier snowmobile events in the Northeast drawing about 6,000 snowmobile enthusiasts. Taking place the weekend of March 6 and 7, this event gives snowmobilers the chance to check out the latest and greatest snowmobiles. The event, which takes place at Coleman State Park, began in 1993 as a fundraiser for the Swift Diamond Rider’s Club. Cross country skiers and snowshoers who are up for a challenge may compete at this year’s Ski and Shoe to the Clouds. Dubbed North America’s toughest 10K, Ski to the Clouds, which takes place March 1, takes racers up the steep slopes of Mount Washington, offering a challenging opportunity to push yourself to new heights. 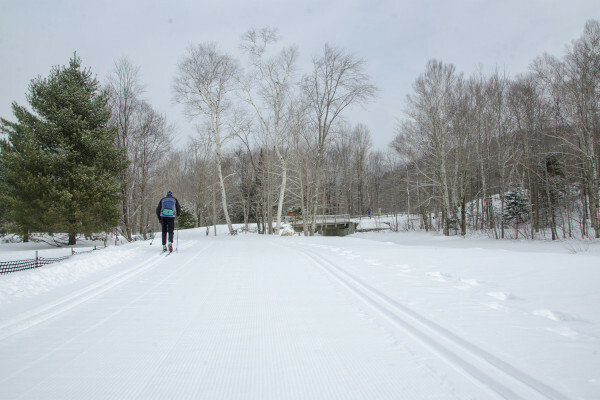 On March 8, the Bretton Woods Nordic Marathon offers long-distance cross-country skiers an opportunity to compete against some of the stiffest competition in the region. Hosted by Bretton Woods Nordic Center on the grounds of the Omni Mount Washington Resort, this event features marathon and half marathon distances. Since 2009, cross country skiers have hit the trails in this annual race on one of the largest Nordic systems in the northeast between the Mount Washington Hotel, the Presidential Range of the White Mountains and Bretton Woods. For a uniquely-New Hampshire experience, The Great North Woods Sled Dog Challenge offers a weekend of dog-sledding fun and excitement for all. The three-stage race kicks off at Back Lake Road in Pittsburg on March 13. Dogsled teams continue from Pittsburg to the Mahoosuc Inn in Milan before finishing at the Colebrook Country Club on March 15. Or, maybe you would like to see the view from a dogsled yourself? Muddy Paw Sled Dog Kennel in Jefferson offers a variety of tours and adventures, ranging from two-hour trips to full-day trips. Enjoy some relaxing family fun with a sleigh ride at Bear Tree in Pittsburg. Take in the Grand North’s scenic, wintertime beauty as a team of Clydesdales does all the work. Rides will take place Saturday afternoons through March 1, which makes for a great Valentine’s Day date, February 14. Looking for a more relaxing snowshoeing experience? Starlit Snowshoe Tours at Great Glen Trails offer great family fun under the stars of northern New Hampshire. A guide will help snowshoers navigate unlit trails using the stars as beacons in the night. Snowshoers ages 8 and up are welcome. Hitch a ride on the Mt. Washington SnowCoach and take in Mount Washington in all its snow-covered glory. Relying on a 4-track, all-wheel-powered drive-train, the SnowCoach takes passengers to treeline at about 4,200 feet in elevation, providing a glimpse into a sub-arctic world. After a day of fun outside, it is time to warm those red cheeks and numb fingers. Pop over to the family-owned Schilling Beer Co. in Littleton for a hot meal and a cold, craft brew. The Grand North’s brewpub, which boasts a selection of 14 beers and great food, is a continental European-artisanal brewery. Schedule a massage at the Omni Mount Washington Hotel. With a full array of massage options, treat yourself as you unwind and work out the kinks after a long day in the fresh mountain air. Warm up with a freshly brewed cup of coffee or a steaming mug of hot chocolate at the Moose Muck Coffee House in Colebrook. Have a hot sandwich or cup of soup while you’re at it. And maybe throw in a piece of key lime pie as well. Moose Muck relies on local ingredients whenever possible. For more information on NH Grand, visit www.nhgrand.com, New Hampshire Grand on Facebook, and NH Grand on Twitter. To sign up for the monthly e-newsletters, visit http://www.nhgrand.com/newsletter-sign-up/default.aspx. New Hampshire Grand, the official visitor information source for Coos County, has launched Grand Deals to invite summer travelers to stay and play at some of NH Grand’s premiere lodging and attractions at a discounted price. Current Grand Deals include adventures and lodging packages at Bear Rock Adventures in Colebrook, and the Bretton Woods Canopy Tour and the Omni Mount Washington Hotel – both in Bretton Woods. Bear Rock Adventures, the premiere ATV and OHRV rental agent in the North Country, is offering the Grand Deal of 10% off rental reservations. ATV novices and enthusiasts are encouraged to rent an ATV or OHRV for the day or weekend and Ride the Wilds, the 1000+ miles of interconnected ATV trails throughout northern New Hampshire. This Grand Deal must be redeemed through the Grand Deal website. Using the promo code NHGRAND14, the Bretton Woods Canopy Tour is offering the Grand Deal of 10% off reservations for the Bretton Woods Canopy Tour. Situated high on the slopes of Bretton Woods and descending over 1000 feet of elevation, the three-hour tour takes nature-lovers and thrill-seekers across a series of nine tree-top zip lines through a network of platforms and sky bridges high in the ancient hemlocks. The Omni Mount Washington Resort in the majestic White Mountains offers a four-diamond White Mountain getaway just 2 ½ hours from Boston, with guest access to all resort activities and amenities including two golf courses, a full service spa and year-round Canopy Tour. Take advantage of the Grand Deal and enjoy 10% off lodging with promo code “GRAND”. To learn more about NH Grand’s Grand Deals, visit www.nhgrand.com/deals. Grand Deals are subject to availability, and restrictions and black-out dates may apply. Maple sugar season has arrived in New Hampshire’s Grand North, a little earlier than usual, but every bit as sweet. According to the New Hampshire Maple Producer’s Association, the warmer than normal winter has caused maple season to arrive about a week to ten days earlier than expected; however, it is projected to last the typical 4-6 weeks with the current weather pattern. Five Coos County sugar houses are participating in this year’s NH Maple Weekend on March 24th-25th, among them, Fuller’s Sugar House in downtown Lancaster, a “Best of New Hampshire Grand,” where maple syrup has been a tradition since 1972. When the maple season begins, this fourth generation family-owned sugarhouse taps maple trees in four “sugar bushes” or “maple groves” in the Lancaster area. Each spring Fuller’s taps more than 9,500 maple trees, boils down more than160, 000 gallons of maple sap and produces over 4,000 gallons of maple syrup. Sap is collected by a plastic tubing system and hauled to the sugarhouse where it is boiled to golden smooth syrup. Owner Dave Fuller says, “This year we’ll be offering visitors everything from syrup on snow to homemade dipping donuts to sour pickles, which are actually very traditional this time of year. After eating so much ‘sweet stuff’ people need to cleanse the palette so they can start eating more sugar on snow again!” Dave adds that he is optimistic about this season because the quality of the first sap and resulting syrup were very good; and winter seems to have returned for the time being, pumping “new life” into the maple sugaring season. Bisson’s Sugar House in Berlin is another sugar shack located in the Grand North and it continues a third-generation family tradition that dates back to 1921. Although they’ve modernized their sap collection system to be more efficient, they still boil their sap on a wood fire evaporator. During the sugaring season, they also make their special maple butter, taffy and maple candy. The Mountain View Grand in Whitefield features lodging specials during the maple season, which include a visit to Fuller’s, right up the road in Lancaster. One special celebrates the arrival of snow with two nights at 55% off. This includes a special promotion of $199.00 for two nights in a Grand View room plus a bottle of wine, and a $25 resort credit. For those not interested in snow activities, MVG offers horse-drawn carriage rides, sok tub sessions in the Tower Spa and more. While staying at the Mountain View, visitors may want to treat themselves to its signature Maple Sugar Body Scrub. The treatment begins with a reviving sugar scrub and ends with a light massage with bio-maple moisturizing cream. The New Hampshire Maple Experience is back on tap at The Rocks Estate in Bethlehem this spring. Maple tours are scheduled for March 12, 19-20, 26-27, and April 7-8, from 10 a.m.-4 p.m. each day. Reservations are recommended. Visitors learn how to identify the sugar maple trees that produce the sap for making syrup, hear the history of maple sugaring, and see part of the process demonstrated on-site. The Rocks also offers horse-drawn wagon rides through the scenic property as well as plenty of tasty treats. And for those looking to turn the springtime Maple Experience into a weekend-long North Country stay, The Rocks collaborates with local inns to offer weekend vacation packages. “Experience New Hampshire’s Grand North” is the brand of New Hampshire’s North Country marketing initiative – also known as NH Grand — and is the official visitor information source for New Hampshire’s Grand North and the Northern White Mountains.